Effective teamwork is vital to the success of every organisation and even more so in times of political and economic instability, however, few organisations actually quantify what it is, how to measure it and how to achieve high-performance in teamwork. Understanding why one team performs better than another is hard to crack. Google has spent millions on Project Aristotle with inconclusive results. However, Nick Fewings, CEO of Ngagementworks believes he has cracked it with a combination of behavioural profiling and the Team DyNAmics© Model he created. Nick explains. What they did measure though, is what I call “bottom-liners,” i.e. indicators of performance that affect the P&L. Due to the pressures on private companies to maximise returns for shareholders and both public and 3rd sector organisations, striving to minimise their cost income ratios, focus is very much on the “bottom-liners.” Whilst these measures are important, so is an understanding of how effectively the individuals within those teams ,who deliver the “bottom-liners” are working together. Organisations try to balance measuring “bottom-liners” by undertaking Employee Engagement Surveys, but many of these tend to ask questions that measure “corporate wellbeing and engagement” and do not address the day to day issues that impact on a team’s performance and engagement. In addition, many staff see these as just another “tick in the box” exercise that they’ve done before, which they perceive has having little or no impact on their day to day jobs. They also see themselves as distant from the results and therefore do not take ownership of them. The ones who often suffer are the leaders, who need to release their hard-worked and limited staff resources to ‘fix’ engagement issues, when their results are below the norm. However, when Sunday evening comes and peoples’ minds turn to the next working week, it is how their immediate team works that either excites them or fills them with dread, not whether they have 10% off corporate membership to their local gym. That is why the WHO and HOW of teamwork is important to measure, understand and manage. DO YOU UNDERSTAND WHO IS IN YOUR TEAM? Coaches that achieve success with their teams, whether it be football, basketball, rugby, cricket or other sports, have an in-depth knowledge of not only the technical skills of their team but also what they are like behaviourally. Are they loud, quiet, thoughtful, a creative team-player, someone who needs the tactics spelt out to them or someone who understands with little detail given. The same applies to business teams and it is important that leaders understand these things about the individuals within their team, to maximise both their behavioural preferences and technical skills, in order to play to an individual’s strengths. In addition, understanding the whole team, provides excellent information on how the team are likely to behave together, which impacts on team meetings, decision-making, how creative they are and many other aspects of teamwork. 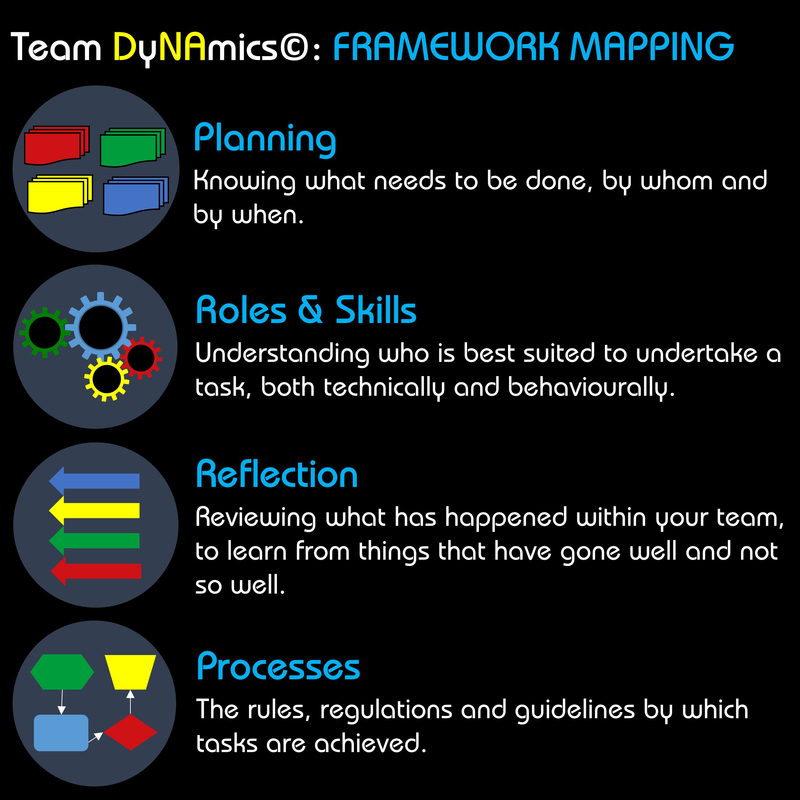 The understanding of WHO is in your team can be achieved by using personality profiling and mapping the team. There are many excellent tools in the market to enable this and the key is to ensure that you use one that is highly-regarded and use someone who knows the model and profiles well to bring them to life, explaining their practical application in the workplace. Based on my many years’ experience of both leading teams and facilitating team development, my research identified 16 Elements that form the foundation upon which high-performance teamwork can be achieved. Each of these 16 Elements bonds at a higher level, to what I call Categories. 4 Elements, each linked to the 4 Categories. 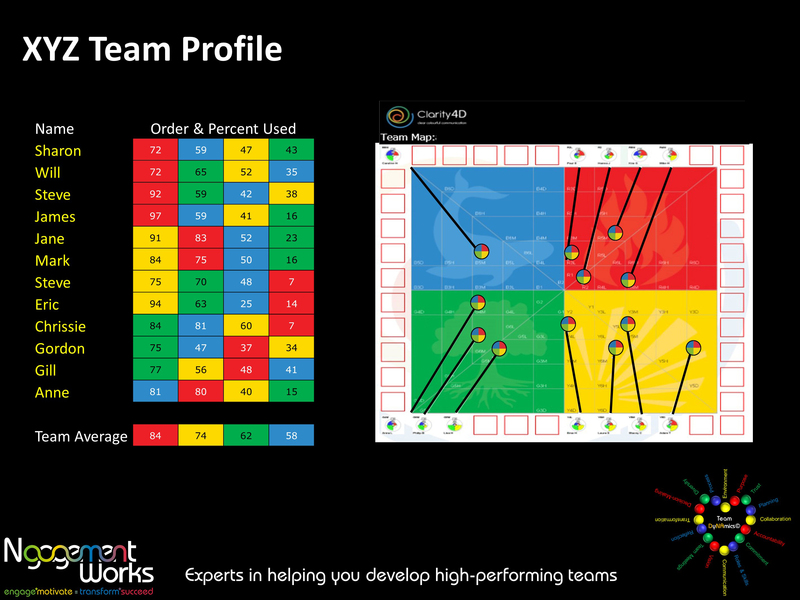 I then developed an online questionnaire, which team members complete about how they perceive their team is working, using statements that focus on the 16 Elements. The results are amalgamated to produce a Team DyNAmics© Report which measure each of the 16 Elements, the 4 Categories and overall Team Engagement. 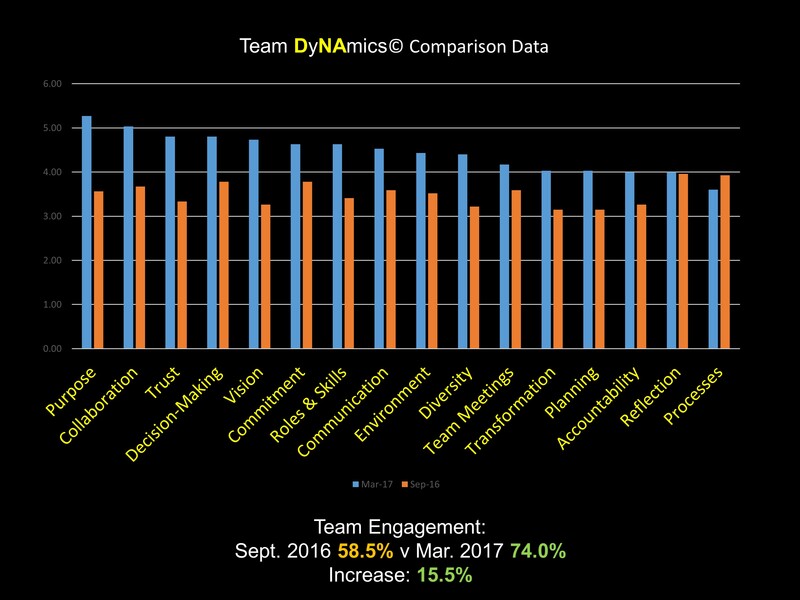 The data is extremely powerful in highlighting both what is working well in a team and what is causing them a challenge. The team own their results and are therefore more likely to take action to overcome their challenges. Re-running the questionnaire multiple times enables the team to track whether their performance, as a team is becoming more effective. Uplifts of 15% in Team Engagement are not uncommon over a 6-month period. I believe that leaders and teams should be spending about 50% of their time on setting the strategy, goals and direction of the team and 50% on the WHO and the HOW of teamwork, in order to achieve the goals that have been set. I have found that a lot of leaders and teams are spending the majority of their time focussing on task-related activities, due to the focus on “bottom-liners” and also the fact that they don’t have the tools to measure either the WHO or the HOW of team performance. 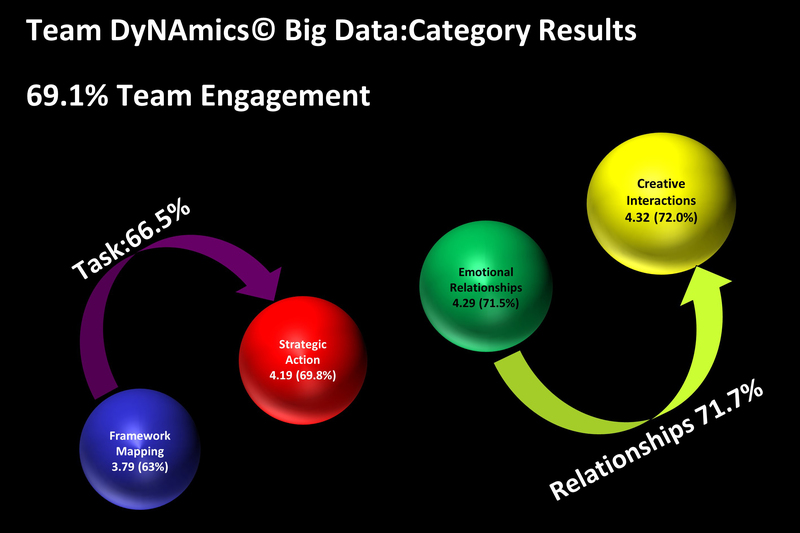 WHAT ARE THE BIG DATA TRENDS FROM TEAM DYNAMICS©? The big data from using the model with teams is fascinating. Having used it at leadership, operational and project level, across different industries and sectors, has produced some extremely valuable and interesting data and themes. Whilst team members are saying that they are proud to work in their teams and that they are happy to give support and help to their colleagues when needed, it also highlighted that regular meetings to review individual performance against objectives are not happening as often as they should and that a lot of teams have systems in place that hinder, not aide them to work effectively.